It has been a long time since we heard the lapping of waves on a lakeshore. I grew up in the “Land O’Lakes” (Minnesota), but in the past 25 years, we have mostly spent time by the sea, whether the Oregon Coast or many locations along Italy’s magnificent shore. 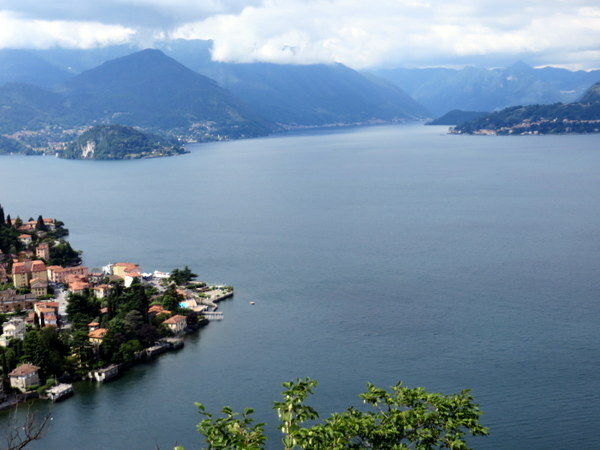 When we ventured to Lago di Como a couple of weeks ago and were struck by how different a lake sounds. The last time we were by a lake was 2008 and the body of water was Lake Superior. 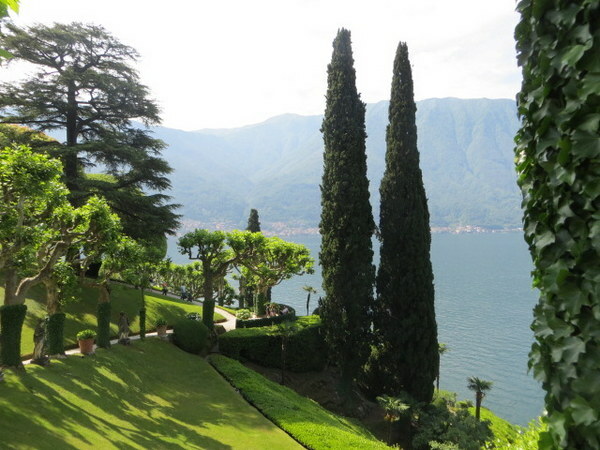 Lago di Como was an entirely different experience. 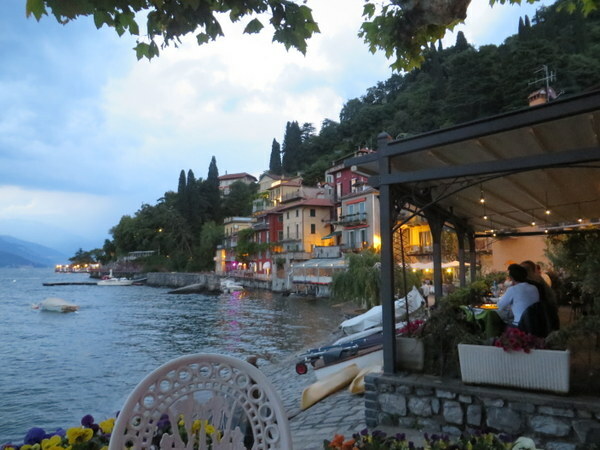 Varenna, on the shores of Lago di Como, has been on my list for 4 years, but as we often say, “So many places, so little time.” We took advantage of an Italian holiday weekend, La Festa della Republica. 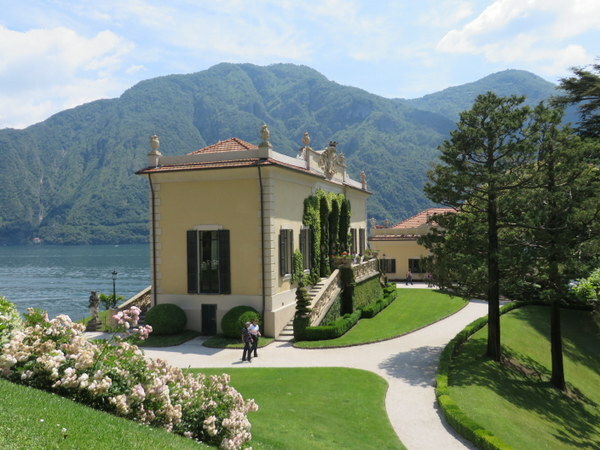 So what does one do at Lago di Como? Hike…eat…ride ferries…eat…visit beautiful villas…eat. Repeat. Funny aside: In my hometown of Saint Paul, MN, we have Como Lake and Como Park. 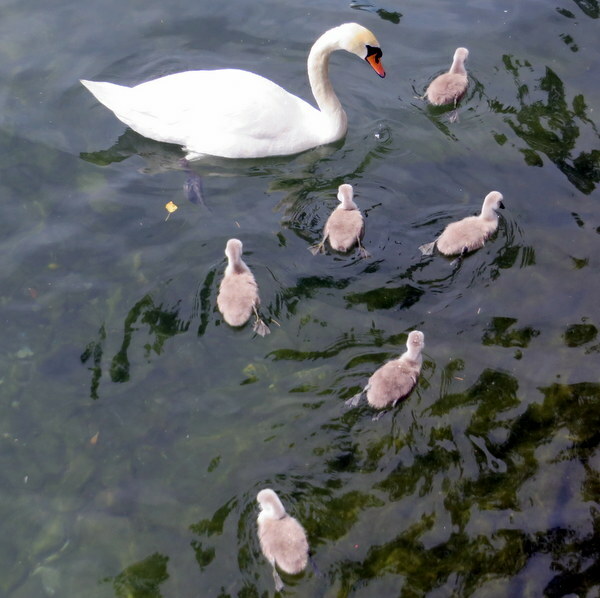 The lake was named by Charles Perry, a farmer who was a native of the Swiss-Italian Alps. 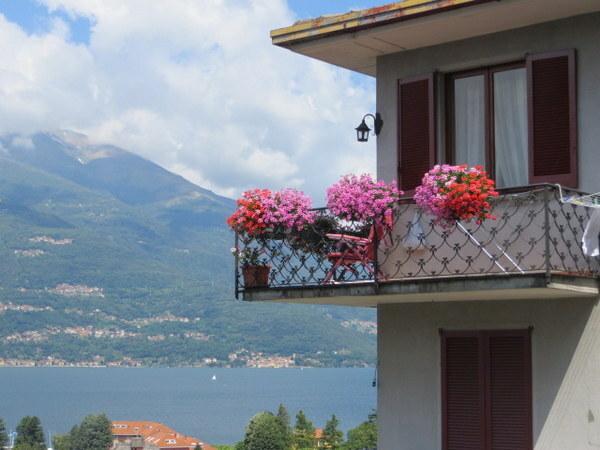 (Switzerland is only a stone’s throw from the Italian lake.) It is funny for a lake in Scandinavian-settled Minnesota to be named for an Italian lake, but there you have it. It was quite a climb to the castle, which unfortunately was not yet open for the day, so we moved on, happy to find some level ground. The day was cool and the views spectacular. I will let the pictures tell of the beauty. Above Varenna there is a castle in Castello di Vezio. It was closed when we arrived at 9:30AM. Ric provided a spot of color in the otherwise gray stone town. The trail changed surface many times: occasionally on a road, but mostly gravel, dirt, rocks, flagstone-like. View to Varenna from the trail. 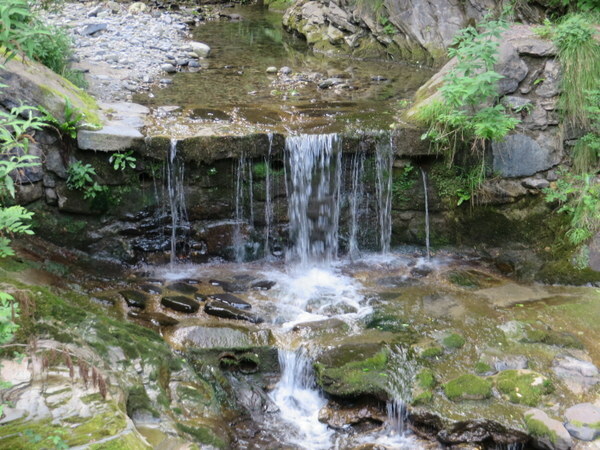 This tiny falls reminded us of PunchBowl Falls in Oregon. The way-finding was not quite so straightforward. There were many signs but they did not always include our actual destination, and there were several branches of the Sentiero del Viandante, so we constantly had to check and recheck the limited-info brochure from the internet. Twice we were helped by locals that only spoke Italian. Once, emerging from a forest onto a road, we turned in absolutely the wrong direction. Luckily a man nearby responded to my query and was able to turn us around before we backtracked too far. Non si pùo sbagliare! In another instance, in the middle of a tiny town, the sign disappeared. We tromped around for a while looking for the right street name to rejoin the proper path. Non si pùo sbagliare! Finally, in descent into Bellano, which we could see for a very long time, we had to walk around the town from above to find a place to descend and then, of course, the Viandante signs disappeared (Non si pùo sbagliare!) 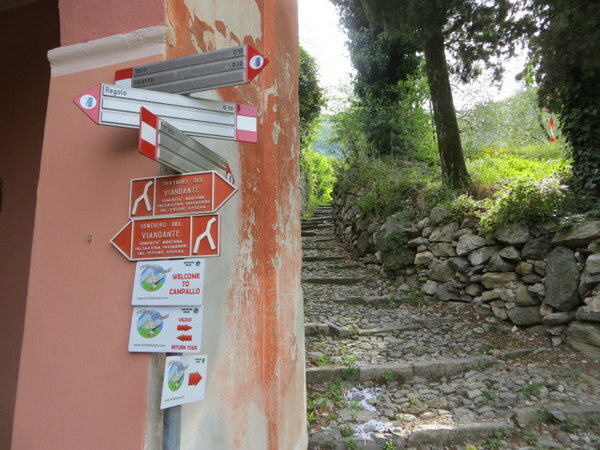 and we had to do some basic orientation to find the train station, for our ride back to Varenna. Lots of signs, not always helpful. 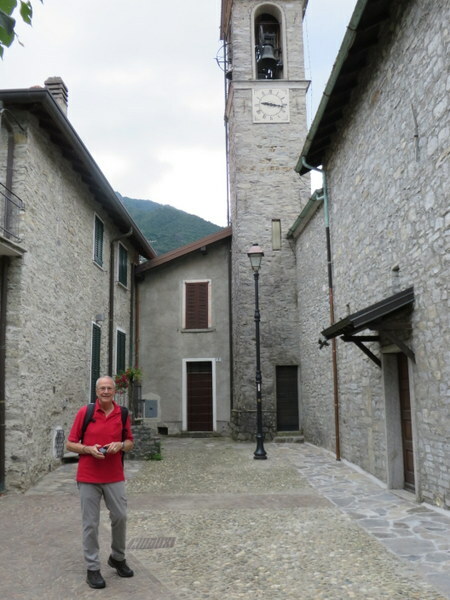 As to Rick Steves’ time estimate, allora, he must have been 30 years old, accompanied by a guide, and did not stop to take any photos if he made Varenna to Bellano in 1.5 hours! We are not the fastest hikers in our age group, but it took us more than double the time, and our stops were limited. We did not even get coffee along the way! Che piccato! Still it was a lovely hike with drop dead views around each turn, wild flowers blooming, cherries ripening on the trees, the way dotted with tiny towns and shrines, and there were no other hikers. The only other person we saw “hiking” was an elderly man with a walking stick above Bellano, who kindly confirmed we were alla strada giusta (on the right path). Our 3-hour-15-minute out-bound hike ended with a 4 minute train ride back to Varenna. Imagine a time a couple of hundred years ago when there was no train and if you could not afford to pay someone to take you by boat, you walked or rode a mule. 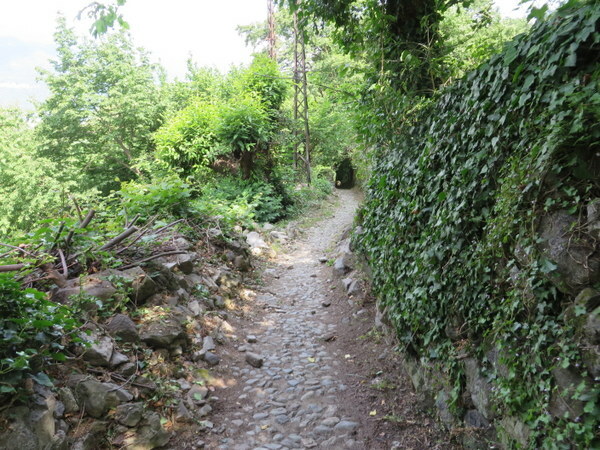 That’s why these paths exist today: former transportation links, not simply constructed for recreational hiking. 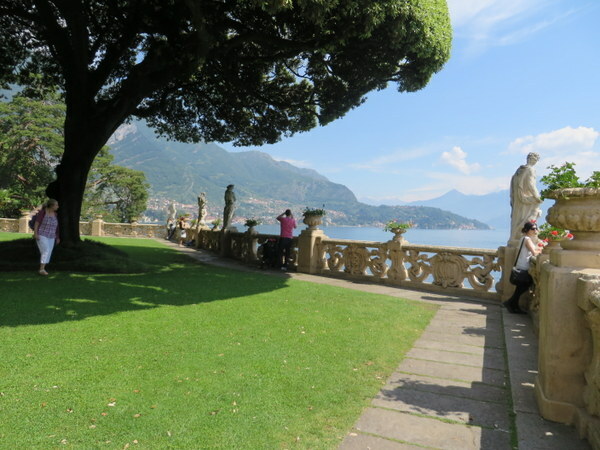 The next day found us riding ferries and visiting a famous villa, Villa Balbianello. This is where the wedding scene at the end of “Star Wars Episode 2” was filmed. Che bella! It is absolutely dreamy! No longer privately owned, it was built by a Cardinal (of course!) in 1787, but last owned by Signor Guido Monzino, the wealthy son of a department store magnet, who spent his life adventuring: Mount Everest, the North Pole, and so on. Today it houses his personal collections and is preserved for posterity and the enjoyment of visitors. Well worth the trip. 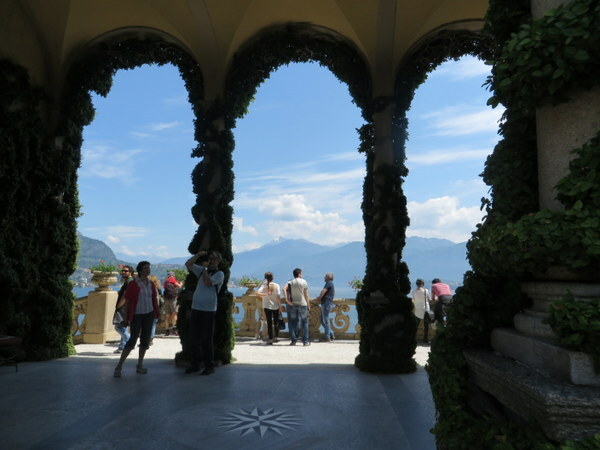 Villa Balbianello loggia overlooking the lake. View from inside the loggia. I believe this was featured in Episode II. The grounds are simply magnificent. Popular wedding location. 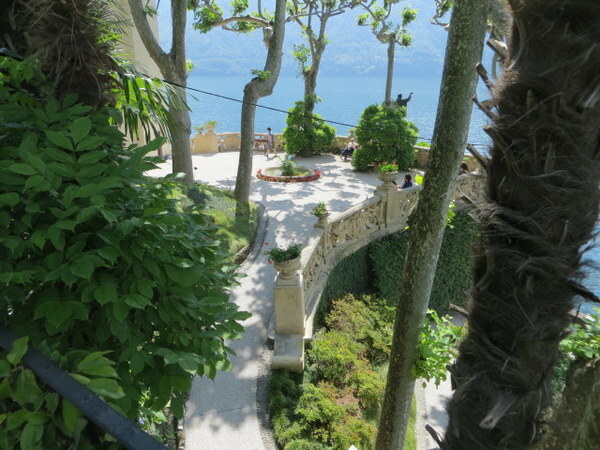 Many paths meander through the villa. Guided tours take you through the 5 levels of the palazzo. Just another gorgeous view. The cardinal had an eye for a good location. Bellagio, on the other hand, we found repulsive: hoards of tourists flocking the designer shops. 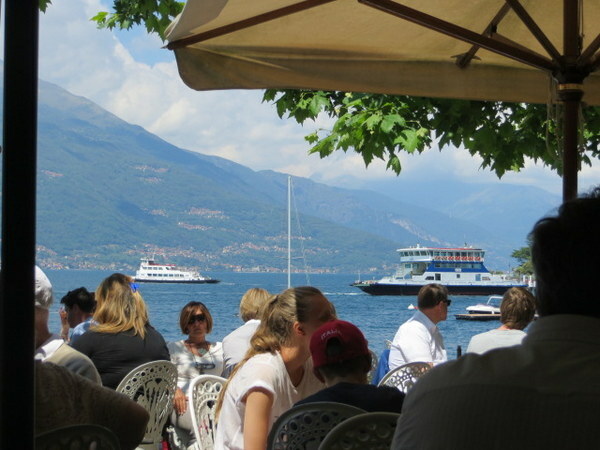 It was ferry-central with boats arriving constantly from all over the lake. Such a hubbub! 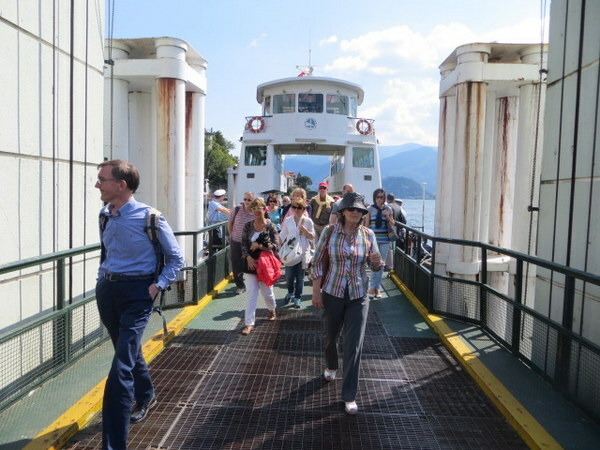 We arrived by hydrofoil and jumped on the first available boat back to peaceful Varenna. The gustatory aspect of visiting a lake is eating freshwater fish. I adore salmon, tuna, swordfish and the like, but nice, white, lakefish takes me back to land-locked Minnesota, where we didn’t have such exotic seafood when I was young. I enjoyed the local fish prepared several different ways. Our favorite meal involved being picked up at the lakeshore and being whisked high above Lago di Como to the small community of Gittana, where Chef Moreno, and his wife Rosella run Il Caminetto. Their €25.00 menù degustazione was unbelievable! 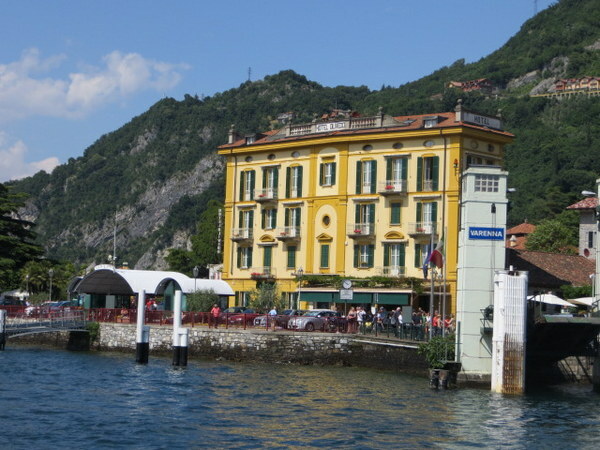 Hotel Olivedo, right on the lake. Fabulous! Outdoor dining very much in full swing with abundant spring sunshine. One of several types of ferries plying the waters of the lake. This one for vehicles and people. This is a great destination for a long weekend. Not a lot of “must sees’ but enough to do to fill 2 ½ days, and plenty of opportunity for relaxing. Rick Steves recommends the area for getting over jet lag upon arrival from the U.S. We would recommend it as a haven from the noisy city, a refreshing break before the tourist season is in full swing. 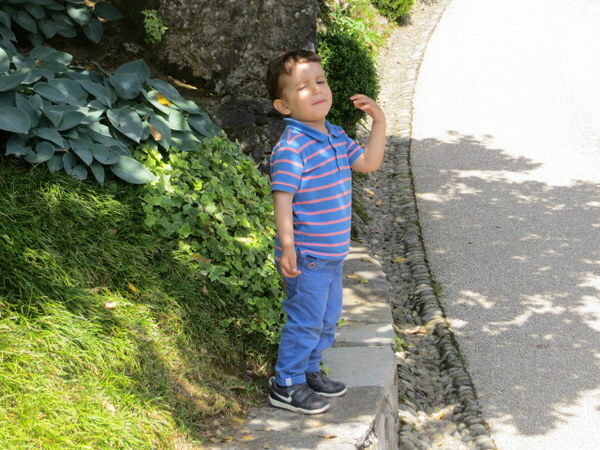 This little guy seemed to be imitating one of the statues at Villa Balbianello. I love Varenna! So nice and peaceful compared to the more popular places on the lakes. Yes, Nerys, it’s true! I wondered why Rick Steves was so insistent on it as a restful location. Now I know…. I’m with you, I could so easily live there, the quiet side. Just beautiful pictures, as always! Thanks Anita! Hope Scott had a nice Father’s Day. Mountains + water = a perfect location! 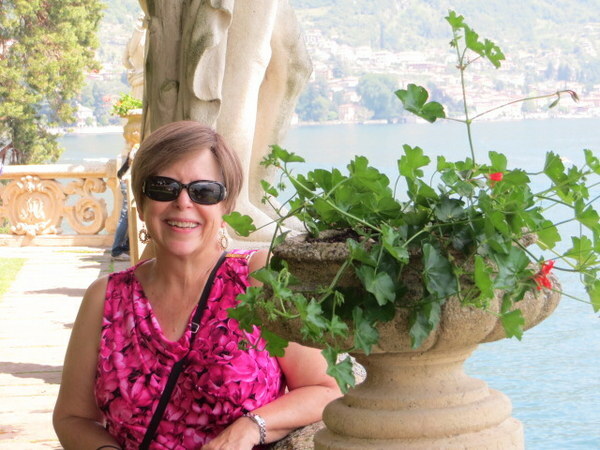 We ended our 5 week stay in Italy staying several days in Varenna. we also enjoyed the dinner up in the hills.Was a wonderful meal we had by the fire last OCT. It really was a find by Rick Steve’s! We were the only English speakers there.We felt after all the touring we deserved a laid back respite and time for reflection before flying out of Milano to the states. Hi Linda. Thanks for writing. Yes LdC would also be a great place to end a trip! I could live here! On the quiet side of the lake that is! Yes! Avoid Bellagio! Maybe it’s nice in the off-season, but wow what a disappointment it was in June. We like our quiet on vacation. Holy cow are those beautiful views! We read so much about this lake. I do find signage in Europe overall lacking so glad to know I’m not the only one! Dud you see where George Clooney lives? Hi Marcia. George lives a bit further down the lake than Villa Balbainello, on the way to the town of Como. We did not take the private boat tour that purports to pass his villa. I can only imagine how beautiful it is! The signage in the north — the Dolomites — is fantastic. but then everyone their thinks they are Austrian!